In 2013 UWA celebrated our Centenary and ranking as a World Top 100 university. A year of special events were held to acknowledge our 100th birthday as we shared the celebrations with alumni, friends, students, staff, industry partners and the community of Western Australia. 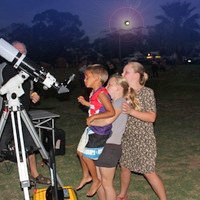 For the past 100 years, UWA has contributed significantly to the intellectual, cultural and economic development of the State of Western Australia and the nation as a whole. Across our Centenary year we showcased our proud heritage, including our recent recognition as a World 100 university, as we shared our vision for century ahead. Helping us to celebrate our 100th birthday and ranking as a world top 100 university, our popular Centenary mascot, Centum, popped up around campus and across the world, starring in photos with students and alumni in some amazing places. We invite you to view the images taken at the many amazing Centenary events and activities which capture UWA’s celebration of a century. The UWA Crawley campus is widely acknowledged as the most beautiful university campus in Australia and one of the most beautiful in the world. From 7pm until midnight on Friday 8 February 2013, it was transformed into a walk-through phantasmagoria hosting a continuous program of performances, displays and installations, a delight of light, art and history. The program highlighted key moments and individuals in the University's history through high-quality work designed with a broad public appeal. Many of the activities feature UWA graduates, students and teachers, while others showcase prominent West Australian and national artists. From the start of the celebrations at LUMINOUSnight, the University’s gift of art and culture to the people of Western Australia; to visits across the State as part of the UWA Gives Back Centenary initiative; and our popular Centenary mascot, Centum – enjoy a wonderful selection of photos which capture the celebrations of a century, along with some beautiful historical images. To mark its centenary, UWA produced a book that celebrates the University's 100 Treasures. In a delightful mix of the serious and light-hearted, the book's images and captions provide glimpses of a fascinating story of cutting-edge research, magnificent art and cultural collections, iconic buildings, memories of student life, a lively centre for the performing arts, magnificent gardens and, most enticingly of all, some secret places and hidden treasures that rarely, if ever, have seen the light of day. The book is available from UWA Publishing, Visitor's Centre and at major Perth bookshops for $24.95. Seeking Wisdom: A centenary history of The University of Western Australia is a new hardcover book commissioned by the UWA Centenary Planning Committee that charts the changes the University has undergone in its first century as well as the challenges it has met. 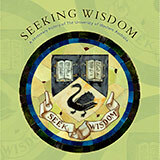 Using a thematic approach to depict both the internal and the external aspects of university life, each chapter of Seeking Wisdom draws upon archival research as well as the recollections of graduates to explore the remarkable contribution that the University has made to local, national and international communities. This richly illustrated commemoration of the first one hundred years of UWA is both a record of the University’s past and a promise for its future. Purchase the book online from UWA Publishing. The UWA Centenary Trust for Women was established in 2002 to raise funds to provide scholarships and other support for women whose educational opportunities are limited. In addition to the annual lunch and seminar, the Trust launched the Centenary Trust for Women's Graduates' Walk which features granite pavers inscribed with names of graduates around UWA's beautiful Oak Lawn. By purchasing a paver and being part of the Graduates' Walk, you will be helping to provide advice, financial assistance and other support to women whose educational opportunities suffer because of distance, financial hardship, cultural differences, disability or responsibility for the care of children, the ill or elderly. No institution exists alone and the Centenary was a great opportunity for UWA to acknowledge the part in its history played by the people of Western Australia, near and far. UWA Gives Back was a regional celebration of the Centenary with staff and students going out into the regions throughout the year, engaging with school students, local communities and industries. They explained research happening at UWA and how it benefits the people of WA; they enthused high school students about tertiary study and encouraged them to come to UWA; they also become involved in local projects including agriculture, urban planning, arts productions and teaching programs. Nazi publications, Catalina flying boats, student protests: each of these tales from our Archives form part of UWA’s collective memory. As well as the University’s big stories, its greatest achievements and its most celebrated staff and students, there are many little stories that add colour and depth to the grander picture; stories of the unexpected, of the thing that didn’t quite go to plan, and of the accidental discoveries.